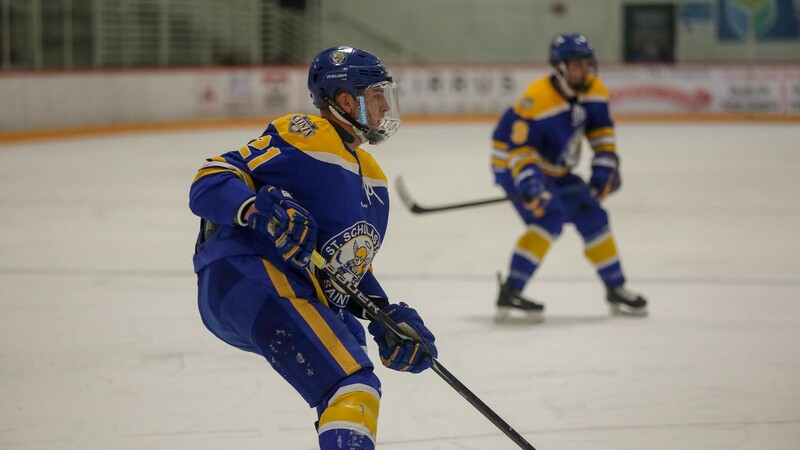 Scholastica men’s hockey team defeated Hamline University 3-1 on Tuesday night in non-conference play at the TRIA Rink. CSS opened the scoring with 4:23 left on the clock in the first period. Jordan Fralich (Duluth, Minn./Duluth Marshall School (Bismarck-NAHL)) had the goal, while Carson Rose (Surrey, British Columbia/Elgin Park Secondary (Weyburn-SJHL)) and Karl Wright (Cambridge, Mass./Cambridge Rindge and Latin School (Connecticut Nighthawks-USPHL)) were credited with the assists. Shots at the end of the period were 12-9 in favor of the Saints. After no penalties in the first period, five penalties were committed in the second, but only the Saints were able to capitalize on a power-play opportunity. It came at 7:42 left on the clock, when Fralich and Parker Mismash (Edina, Minn./Edina HS (Minnesota Magicians-NAHL)) set up Rose to extend CSS’ lead to two. Shots at the end of the second period were deadlocked at 21-21. In the third period, Hamline (2-7-0) was able to get an early goal and cut the Saints’ lead in half. But CSS responded quickly, and five minutes later Parker Weekes (Ketchum, Idaho/Holderness School (Boston Jr. Rangers-EHL)) scored a short-handed goal to restore its two-goal cushion. The Pipers had a power-play with seven minutes left in the game, but the Saints were able to kill it, and the game finished 3-1 in favor of CSS.